RAGE OF THE UNDYING. SIDESHOW EXCLUSIVE. 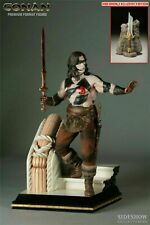 Switch Out right arm wielding Conan's Atlantean sword. The Exclusive Version Includes the following for alternate displaying. Each piece is hand cast of highest quality polystone, hand finished and individually hand numbered, a fantastic addition to any display. THIS ITEM IS IN EXCELLENT-NM CONDITION and DUST-FREE WITH ALL THE ORIGINAL COLOR BOX IS IN VERY GOOD CONDITION WITH NORMAL WEAR. MINT IN BOX, NEVER REMOVED. 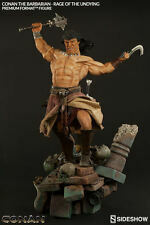 Conan Rage of the Undying Premium Format Statue. Sideshow Collectibles. With pistol in hand, Doc is confidently ready for a shootout. Each piece is cast in high-quality polystone, then hand-painted and hand-finished to Sideshow's exacting standard. 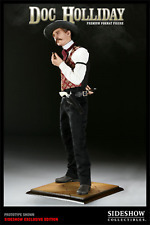 Doc holds a Colt Lightening pistol in hand and carries a removable Colt Peacemaker in his holster along with twenty-five removable pistol rounds. Each piece is hand cast of highest quality polystone, hand finished and individually hand numbered, a fantastic addition to any display. Sideshow Exclusive. Sideshow Collectibles. THIS IS THE LAST ONE OF OUR INVENTORY.